Hi blogland followers, I hope you’re all well. It’s the end of the 1st week of my family staycation fortnight. We’ve had many days out, picnics and visited quite a few play parks. My husband says I’m a bit of a worrier when it comes to letting our 2 year old Miss E free to run around a play ground and try out all the climbing frames and slides. So I’ve had to restrain myself and do you know what, she has really surprised me with what she can do. She thinks nothing of scaling a 5 foot rung of ladders and slide. Miss P is also very good at looking out for her little sister (which is good since Miss E wants to do everything she does). 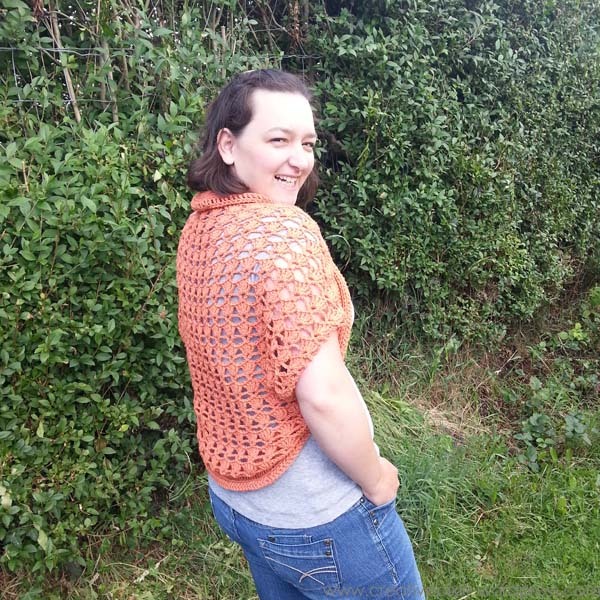 While I’ve been off I have completed my latest crochet project – the Eleanor shrug which I found on Ravely here. The pattern was really easy to follow and the only change I made was that I only crocheted 24″ of the main pattern instead of the suggested 27″. I was worried that it might be too big and baggy if I went with the 27″ so I’m happier with the more fitted result. 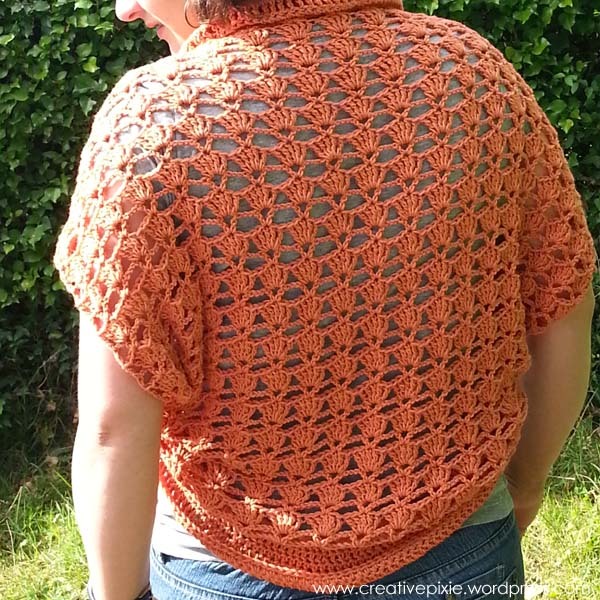 Even though I didn’t do 3″ of pattern I ended up using 6.5 x 50g balls of Louisa Harding, Ianthe yarn (in yummy orange) with the suggested 4.5mm hook. The yarn is 50% extra fine merino:50% cotton so it’s really soft and lovely to work with. I really enjoyed making something for myself for once and would like to make something else in future, does anyone have any other crochet clothing patterns to recommend? Looks great. Can’t help with any recommendations, sorry. I haven’t tried any clothing yet, apart from hats and scarves. Thanks. There’s much more scope to crochet things for the home than for adults. Gorgeous work Jean! You look great!!! The girls were wondering why Daddy wanted to take so many photos of Mummy! Looks great! I love the colour. Orange is my colour at the moment. So cute! You wear it well. Sounds like your staycation is turning out to be a great family time. Hi pretty Pixie Lady! Your pics look great and your shrug looks awesome on you!! Great job!! I want to tackle a garment of some kind now too!! Have a wonderful rest of your staycation! I love staying home on vacations!!! Hugz Lisa and of course Bear too!! Thank you. I’ve just taken Miss P down to the shop to pick some yarn for her own mini shrug. That’s a really cute shrug! Thanks. I’ve started making a little purple one for my daughter. Give it a go, once you know the basics it’s very therapeutic. It also requires less materials than you would need for sewing. 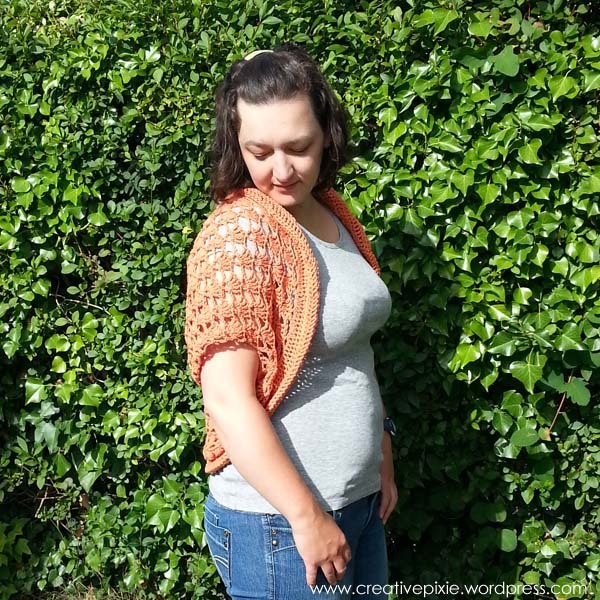 Lovely shrug, orange is one of my favourite colours. I love it’s vibrancy. I never used to like orange but this past year it has really grown on me. I’ll look forward to seeing what your one turns out like. Such a beautiful shrug. Love the colour. Lol. They have to learn by their own mistakes sometimes but it can be hard watching them do that.